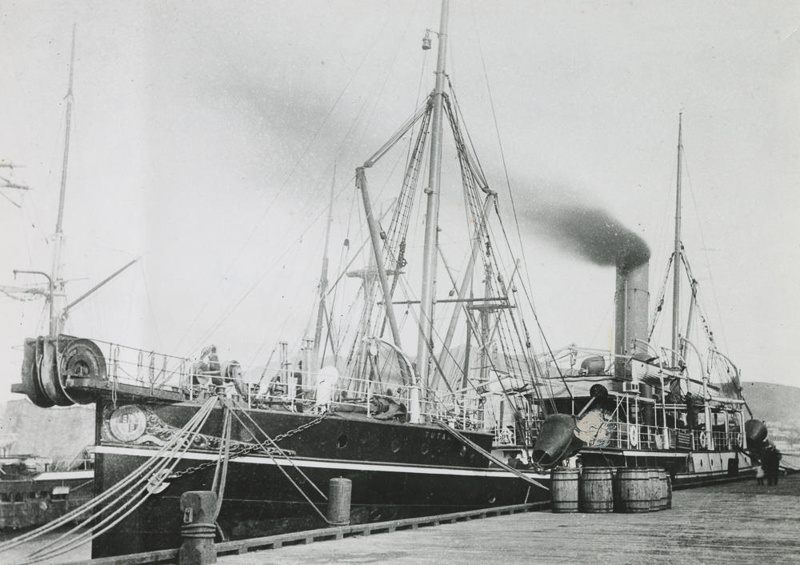 This is a photograph of the N.Z.E.S Tutanekai docked at Wellington Harbour. The N.Z.E.S. Tutanekai travelled around the New Zealand coast dropping supplies off to lighthouses. Additionally, the ship was used to lay communication cables including laying the cable which connects Stewart Island with the South Island in 1902. As a Government Yacht, the ship carried many important passengers in her time, including every Governor from the 1896-1920s, the King and Queen as the Duke and Duchess of York in 1901, the Prince of Wales in 1920, and the Duke and Duchess of York in 1927. In her later years, she became a passenger liner between Stewart Island and the South Island and was eventually scuttled of the Wellington Heads on February 2nd, 1931. Handwritten in pencil/blue pen on back of photograph: '2680.043 N.Z.E.S. Tutanekai at Wellington A124/4470H'.